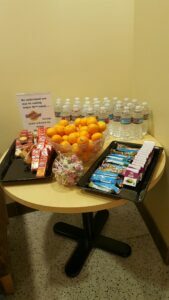 When you walk into the in-house pharmacy at your healthcare provider and see a table filled with snacks and water as an apology for the upcoming long wait, you know you are totally screwed. That is how I felt when I recently went to Group Health to pick up a new prescription. At first, I was happy that they had my favorite snack – peanut butter and crackers – but that feeling soon faded and frustration set in. Once my number was called, I asked about the wait. I was told that their pharmacy upgrade still had problems – it was already 3 weeks out. Needless to say, the pharmacy techs were overly stressed and kept apologizing. It was a very memorable customer experience, but probably not what the sponsor expected. This made me wonder about the person who led this 2-year boondoggle project and let it be deployed with such miserable results. I understand that there were probably any number of underlying complexities that moved this project forward and I also know that the pressure must have been tremendous. But I can’t help thinking that leadership didn’t push back on this implementation. This project tells me that organizationally, the IT department doesn’t have proper testing plans and practices in place to prevent this from happening. So it seems to me that Group Health’s core practices within its IT department are inadequate and that senior management failed to ensure that the proper structure and discipline was in place. The job of a PMO is to make sure that every project has adequate testing built in. When IT project managers create project plans they should have testing activities and testing deliverables clearly defined throughout the project plan. The testing needs to be more than unit testing, integration testing, and functional testing, and must include capacity testing and performance testing. The business processes need to be tested, not just the computer processes. Obviously, Group Health didn’t adequately test in the pharmacy. As part of their testing plan, they should have had risk mitigation built in – for example, what is our fall back position if there is a catastrophic situation? These are just fundamental responsibilities. In Group Health’s case, they relegated testing to the same level as coding so it was treated as a programming activity, not as a quality management activity, as it should have been. An adequate job of testing starts with project planning and project management. It should also have different kinds of tests, testing expectations, testing schedules, and testing activities that are integrated into the entire project. You have to test your deployment, along with everything else that you test. Group Health has a very risky situation because it puts a lot of pressure on the pharmacy techs to review absolutely everything, and is thus the reason for the long lines. You have to wonder what might be slipping through the cracks. In information systems, testing is a company’s primary risk mitigation technique, but if it only occurs at a very low level and it’s about testing computer processes and not about testing business processes, it is full of holes. And when testing plans don’t include reusable components, there is a missed opportunity to rapidly deploy applications and services in a less risky environment. If you are a technical professional who pushes against pressure so that you can do the right thing for your company, I applaud you. When you are searching for a job, this should be a central message on your resume and LI profile. When working with a technical resume writer, don’t settle for the standard questions. What business value did you provide? What was the strategic impact of your project? How much money did your project save? When these are the only questions that the resume writer is asking, then you know that you have the wrong person. While all of the above are good questions, they are insufficient in getting to the complete value that you provide as a technical professional. Remember that when searching for a technical job, its not just about business value, its also about technical value. “My clients tell me I have the rare talent to transform a technical career into a clear, concise, and powerful technical resume. In fact, I’m known for innovative resumes that provide an advantage in today’s intensively competitive global employment market. As the world’s first nationwide resume writer for information technology (CRS+IT), I am a natural choice for technology professionals seeking high-impact career marketing documents. I won a Toast of the Resume Industry (TORI) award in the technical category in 2011, a Career Innovator’s award in 2012, and served as a TORI judge in 2013. This entry was posted in IT Resume Writing Tips, Tips & Articles and tagged IT Job Search, IT manager, Technical Job Search, technical project manager, technical resume writer. Bookmark the permalink.